From 1896 to 1904 A.B. Shackleton worked as a deputy sheriff and a constable. 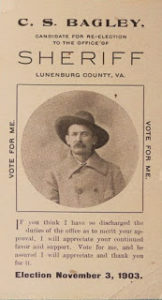 In 1903, he decided to run against his boss and incumbent sheriff of Lunenburg County, Virginia, C.S. 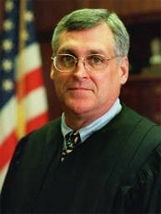 Bagley who had hired Shackleton as a deputy when he was first elected. The deputy defeated his former boss in that election and remained sheriff until his retirement at the age of eighty-three in 1955. I first heard of Sheriff Shackleton when a friend sent me a magazine he found in old family papers. It was The National Sheriff magazine of August-September, 1951. 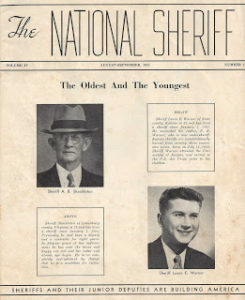 Sheriff Shackleton shared the front page of the magazine with a twenty-two year old sheriff from Scott County, Kansas. The headline was ‘The Oldest and the Youngest’ and the magazine declared that Shackleton, at 79, was the oldest sheriff in the nation. A 1946 bulletin of the FBI reported that the Sheriff was one of the most popular men in Lunenburg County and was more familiarly known there as ‘Shack’. The bulletin also reported that during his tenure as sheriff from 1904 until the article was written in 1946 there were only two major unsolved crimes in his jurisdiction. There are several newspaper accounts of the Sheriff’s exploits in law enforcement. In 1910 he is reported to have arrested a black man who was accused of attempting to attack the eight year old daughter of a prominent citizen. 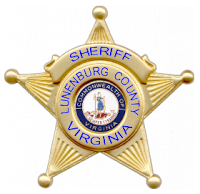 Under the cover of darkness, Sheriff Shack spirited the inmate from Lunenburg County to a jail in another city to prevent the suspect from being lynched by an angry mob. In 1937 Sheriff Shack arrested a member of a prominent Virginia family for taking part in a bank robbery. A bank employee was shot during the robbery. The publicity surrounding the crime prompted the Virginia legislature to begin a movement to establish a state police radio and teletype system to aid officers in the battle against such brazen crimes committed in the glare of daylight. Sheriff Shack began his law enforcement career in the horse and buggy era of transportation, when bare knuckles, fast shooting, and a hangman’s rope ended many crime sprees. 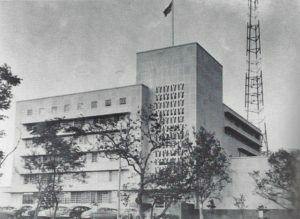 When he retired, police radios, radar, and polygraph (lie detector) machines were in use. There were rumors of atomic wars and still to come was the age of high-tech computers, GPS systems, Tasers, DNA evidence, drones and rubber bullets. If he was still with us, my guess is that Sheriff Shack would accept these new law enforcement tools as just a part of the ever improving science associated with his life-long profession. Sheriff Shack, a life-long resident of Lunenburg County, married his sweetheart, Mary Belle, just a year after being elected sheriff. Mary Belle was also a native of the county. When asked what he was going to do in retirement at the age of 83, Shack simply said, “I’m going to stay home with my pretty wife.” He did just that until his death three years later in 1958. This is a re-run of a very popular story I published some time ago. One of my most popular blog stories was titled A Police Chief during times of change. The story was about Houston’s Police Chief Herman Short. (still available to read on this blog) Short served as Chief during the 1960’s, a time in the South when traditional white values were being challenged and law enforcement leaders were measured by their response to the tides of change. It is tempting to compare such leaders to those who followed 20 or even 50 years later, but doing so gives no context to the times during which they served. A more accurate comparison is with other southern law enforcement leaders of the time. As you read about Neshoba County, Mississippi Sheriff Lawrence Rainey, consider how each man, Chief Short and Sheriff Rainey, responded to change. 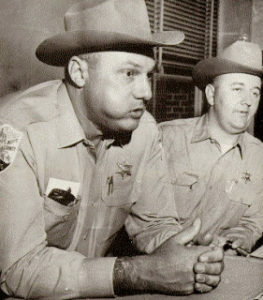 Lawrence Rainey was a one-term sheriff in Neshoba County, Mississippi. He campaigned for the job by responding to those traditional southern white values of segregation and keeping ‘negroes’ in their place. During the campaign he said, “I’m the man who can cope with the situations that might arise,” a reference to dealing with the civil rights activism then coming to the south. And “cope with the situation” he did! Rainey completed eight years of formal education before becoming a mechanic. But, to the detriment of the profession, he soon found his way into law enforcement. In 1959 he was working as a Philadelphia, Mississippi police officer. His reputation was that of a brutal enforcer, especially in the black community. He killed one black man and is reported to have whipped another with a leather strap after stripping his shirt from his back, exacting his own form of justice on the streets of this small Mississippi town that became infamous in the movie, Mississippi Burning. In 1963 he ran for sheriff of Neshoba County and won. He was known as a tobacco chewing, back-slapping Klansman, whose reputation suggested he supported the status quo in its quest to stop the freight train of change coming to the south. Just months into his term, three civil rights workers, James Chaney, Michael Schwermer, and Andy Goodman went missing after being released from Rainey’s jail. A quote from the Sheriff at the beginning of the investigation is interesting. He said, “…and if any semblance of violence should seem to be in the making just leave it to the law enforcement officers.” Was it a slip of the tongue or a veiled reference to what had already occurred? Not long after that comment, Rainey, his deputy Cecil Wright and 15 other men were indicted in federal court for the murder of the three men. Seven, including the deputy, were convicted, but Rainey was not. Their arrogance was amazing. 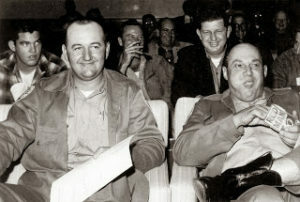 Shown in the photo above, Rainey and his deputy, display a confident smugness upon their indictment. Things didn’t go well for the former sheriff after the trial. He moved to Franklin, Kentucky to work as a policeman. But when the newspapers reported his arrival, civil rights activists sounded the alarm, and the offer of a job was withdrawn. Lawrence Rainey never worked in law enforcement again! “The FBI set out to break me… and they did it.” Rainey said. “They kept me down to colored folks money,” apparently referring to his job as a security guard at a trailer park. He died in 2002 at age 79. Lawrence Rainey didn’t accept a changing society, and as a result, lost the only career that apparently ever made him feel important. Ronnie Beck was a friend, killed in the line of duty in Houston, Texas in 1971. He was run over by a drunk after he stopped another car on Houston’s Southwest Freeway. He was a hero for how he lived. Ronnie was a character! Although he was only twenty-three years old when his life ended, everyone at the Houston Police Department had a story to tell. I related a few of those tales in a fictional short story published in my book, The Park Place Rangers. A more in-depth look at Ronnie’s life can be found in Fallen Heroes of the Bayou City by Nelson J. Zoch. He was a hard-charging cop, who worked the night shift and never waited for crime to come to him. He sought it out. But that was just part of his life. He worked an extra-job at a low-income housing project. When he realized many of the young boys with long shaggy hair couldn’t afford haircuts, he bought a pair of clippers and became a part-time barber, albeit one dressed in a police uniform. He volunteered in the Big Brothers Program, becoming a mentor for some of these same kids. Ronnie donated much of his earnings from this extra work to programs designed to keep kids off the streets through athletic and other programs. Ronnie Beck was from Fordyce, Arkansas. He moved to Houston to become a cop. A tall and affable country boy with a big smile, Ronnie soon earned the nickname Jethro. The name was bestowed upon him because of his enormous appetite and uncanny resemblance to the lovable character by that name on the television show, The Beverly Hillbillies. He’d been married less than three weeks when he was killed. His widow became a Houston officer for a time after his death. There’s an old saying that a police career can be described as years of pure boredom accentuated by a few moments, interspersed throughout that career, of sheer terror. But Ronnie Beck’s career wasn’t boring, nor was his life to be defined by those moments of terror that took it. Had he lived to complete his career, he would have been a legend within the Houston Police community and probably in the lives of underprivileged young people whose lives he impacted. To those who knew him, he is a legend. We overuse the term hero. Ronnie was a hero, not because he was a policeman, nor because he was killed in the line of duty. He was a hero because of who he was as a man. He would have been a hero, no matter what vocation he had chosen.